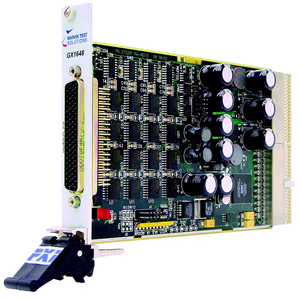 The GX1648 is a 3U PXI digital to analog output board is designed specifically for applications where multiple analog outputs are required. The GX1648 offers precision signal sourcing performance and quality at an economical price. The GX1648 is organized as 4 groups of 16 channels. Each group is programmed and triggered independently. All groups can also be updated simultaneously. All channels provide single-ended voltage and are automatically at zero volts DC after reset to prevent inadvertent damage to external equipment.